This post is part of the Donna Day blogging event to raise money for St. Baldrick’s. Last November the country was swept up in Batkid Fever! Everybody loved Batkid, a San Francisco five year old in remission from Leukemia. The Make a Wish Foundation had made his “wish” come true and involved the entire city of San Francisco in an elaborate scheme that allowed this kid to be a super hero for the day. The entire country got on board, even President Obama sent a message of support. My Facebook feed was full of videos of Batkid and instructions that no one was allowed to be cynical about Batkid, that Batkid had saved the day and restored people’s faith in humanity. Did you know that Batkid went out of remission and died a month later? OK, I made that up, and it was a little cruel. But, do you have any doubt that as much as we all reveled in Batkid, we would all overlook the sad reality of a child dying of cancer? I have nothing against Batkid or the Make a Wish Foundation or anyone who found hope and joy in the idea that the country would come together to make a good thing happen for a sick little boy. What I do have a problem with is the way the cancer industry markets cancer in this country. Breast cancer is all about women taking long walks together and wearing pink shirts while holding pink teddy bears. 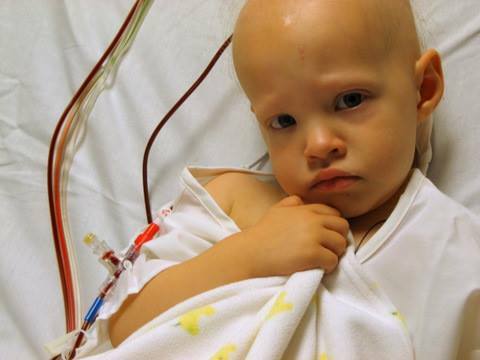 Childhood cancers (the primary disease-related cause of death among children) is all about cute, smiling, bald kids having their wishes come true. If the kids aren’t cute and smiling then they are heroic and teaching us all important lessons about the true meaning of courage and life. Their funerals are all attended by police officers and fire fighters, and we miraculously never see parents grieving over a too-small casket. I don’t deny that Batkid and other children with cancer are courageous and cute. But they are also scared and scarred and desperately ill. The picture above is so rare because on the few occasions when we talk about childhood cancer, we never talk about a child in pain and suffering. You know what those kids’ real wish is? It isn’t to go to Disney World, it’s to not die. Not to be sick. Not to watch their families crumble. Not to be scarred for life if they survive. This is the third year that I’ve participated in “Donna Day.” Donna Day is a day where bloggers around the Internet come together to try and bring awareness to the real horrors of childhood cancer. Not to depress you, but to get you to act and frankly to get you to donate money. If you want to donate money to the Make a Wish Foundation and help create more feel-good events like Batkid, that’s great, I fully support you and think you’re doing a good thing. The world needs all sorts of help, and that is certainly one way to help. But, if you’d like to support children and families with cancer and make their dearest wishes really come true, may I suggest you donate to St. Baldrick’s instead (or hey, how about in addition to, in addition is always good). Donna Day is organized by Jeremy and Sheila, Donna’s loving parents who continue to parent Donna by raising awareness of and funds for childhood cancer. 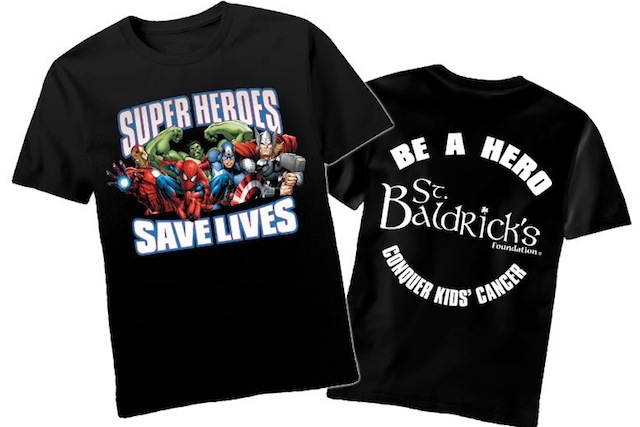 You can contribute directly to their annual St. Baldrick’s Fundraising event here. And to prove that I have nothing against super heroes, pint sized or otherwise, may I also suggest you purchase this adorable superhero/cancer themed tshirt. If you know someone that you think this message will resonate with, please share this post. If this message doesn’t resonate with you, that’s fine. Check out the Mary Tyler Mom blog or FB page (MTM is also Donna’s mother) or the Donna’s Good Things Facebook Page. She’ll have a list of other blogs participating, maybe one of their posts will hit the spot for you. This entry was posted in Family Life and tagged Batkid, childhood cancer, children, Donna, St. Baldrick's. Bookmark the permalink.